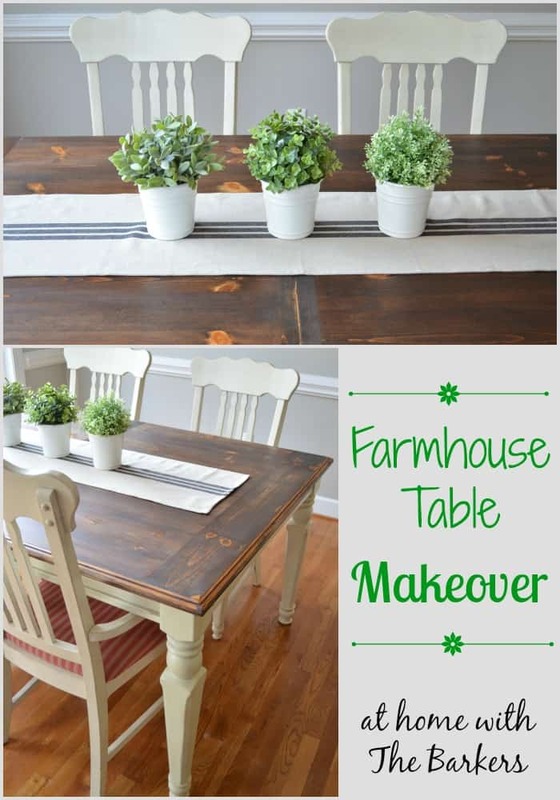 I love my farmhouse table makeover! We bought this table almost 9 years ago so it has lots of wear and tear. BUT honestly that’s the best part. I wanted to do a makeover on it but not really hide any of the “memories” that are carved into it. The top stain was almost the same color as my floor so I was wanting to darken it. I knew the table had a factory finish on it and sanding would be needed. The weather here in South Carolina this week was so warm I took the opportunity to get busy! First thing I had to do was sand. 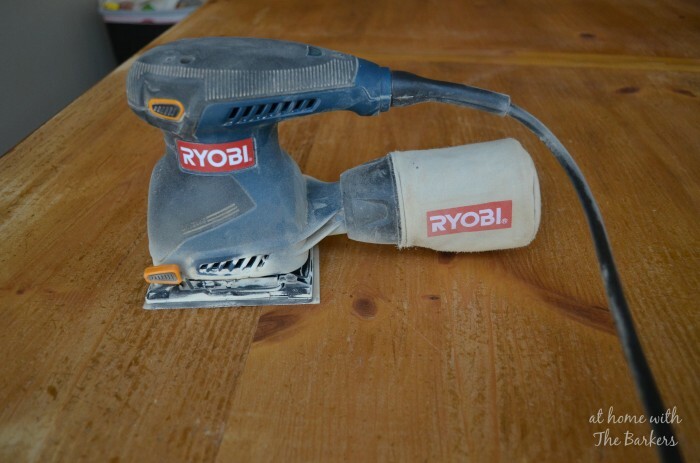 I used a 60 grit sand paper on my Ryobi Sander because I needed to get to the bare wood. I did a second sanding with 150 grit. 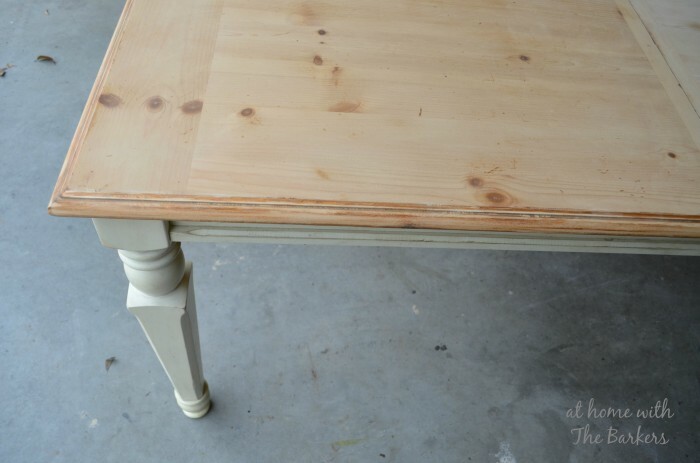 I did sand some around the edges of the table but wanted to leave some of the original finish. This will allow the stain to go on differently in places, which was the look I wanted. I wanted the more rustic and worn look as if the table had been that way for a long time. This part is the hardest part of the furniture staining process but a good work out. Next comes the stain. I used Minwax dark walnut. It is a great shade of dark brown that doesn’t look red. I use a brush to apply the stain then I go behind that with a rag and rub off the excess. The “wipe on, wipe off” method. 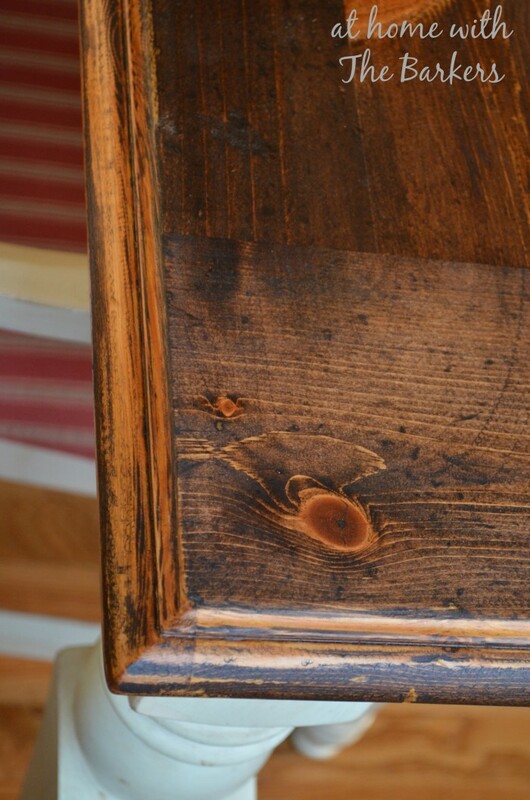 You can see here in the close up how the stain absorbed into the wood and didn’t where I left some of the old finish. I sealed the top with some Annie Sloan clear wax. This is a good view of the table to see how the knots look as well as the contrast of the hardwood floor. I think the knots must have been sealed with a shellac before the original stain was applied. This would not allow stain the penetrate the wood. 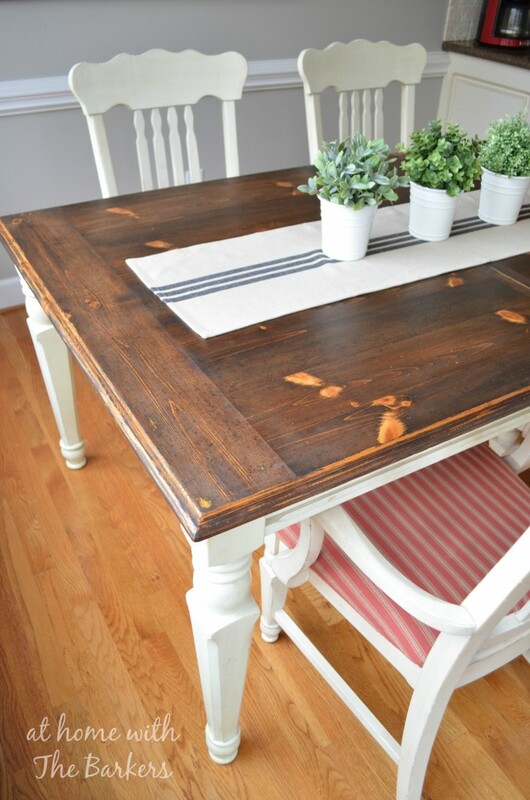 I love this part and I think it gives the farmhouse table a lot of character! Next I have some great ideas (thanks to a brain storming session with my sister) for the HUGE wall by the table, so stay tuned for that! Go ahead and subscribe by email, if you haven’t done that already! If you love Twitter, Facebook, Instagram or Pinterest I would love to have you follow along there as well! I love sharing behind the scenes pics to my social media pages! Visit the Kitchen tour to see what has changed! Now I’m going to tell you a secret. 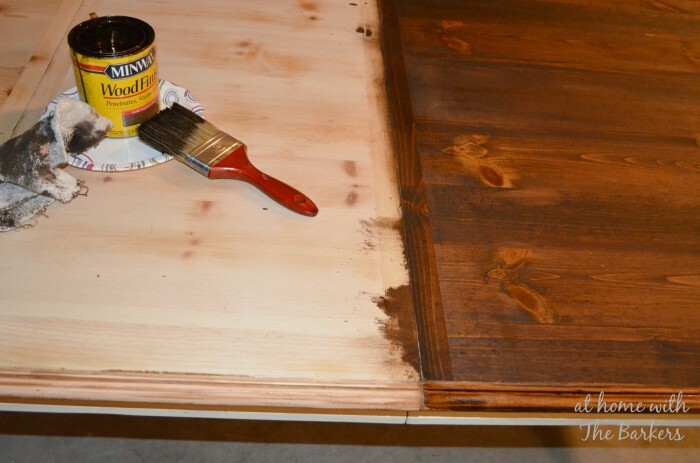 You don’t have to sand to restain. There is a product called Restore. You just wipe it on and it stains wood through the varnish. You don’t have to strip unless you want a lighter color. Just to wipe stain on make darker or same color it is now . It travels through the varnish and doesn’t hurt it at all. You then can put on Wax and feed and looks just like you did a refinish job. Just thought I would let you all in on this secret. This is what antique places have used for years. Sounds like something I need to try! Thanks for sharing!!! Let me know if you can’t find either of these and I’ll give you the mans website to order from and get more information on it. All the antiques store here in our area sell both products now. Wanda, I would love to know where to get the products you mentioned. I did a google search but I don’t think I found the right thing. You did a great job, Sonya! I love it! I love it Sonya! Mine is in really bad shape and needs some TLC. It’s on the list of things to do! Very cool Sonya!! I am wanting to build a farm house table (tired of my oval one!) 😉 I love the refinish! what color is painted on the legs of the table. A job well done on the top. I didn’t paint the legs, they came that way when I bought it. BUT it is very close match to Sherwin Williams Antique White. Looks SO different. Better different. Great job!! 🙂 Love how you use what you have and find cost effective ways to make your updates/changes. What a beautiful update to your table, Sonya. You gave it a totally new look! Thanks for linking up with us at Best of the Nest! Love this! 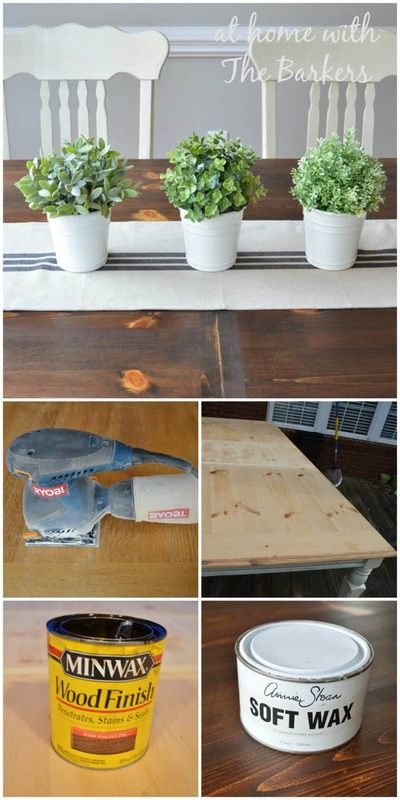 Thanks so much for sharing the stain and wax that you used! I have been wanting to refinish some wood pieces in a rustic look but wasn’t sure which stain to go with! Looks amazing! Love the dark wood top! Gorgeous – Minwax Dark Walnut is my favorite too! 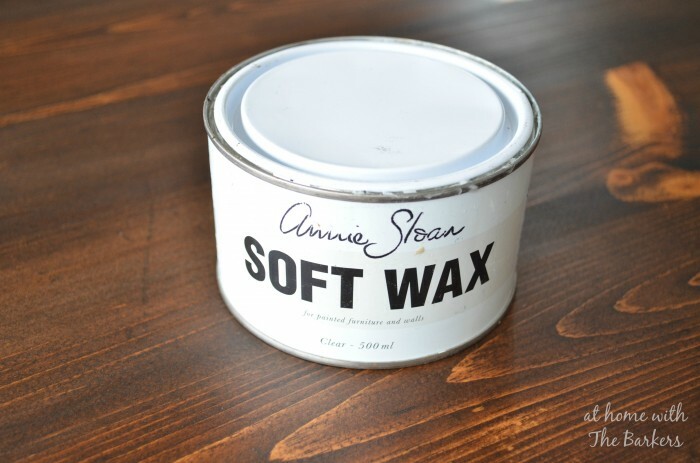 I learned something new today from your post…I’ve never tried Annie Sloan Soft Wax over top Minwax stain. Thanks for this tip! 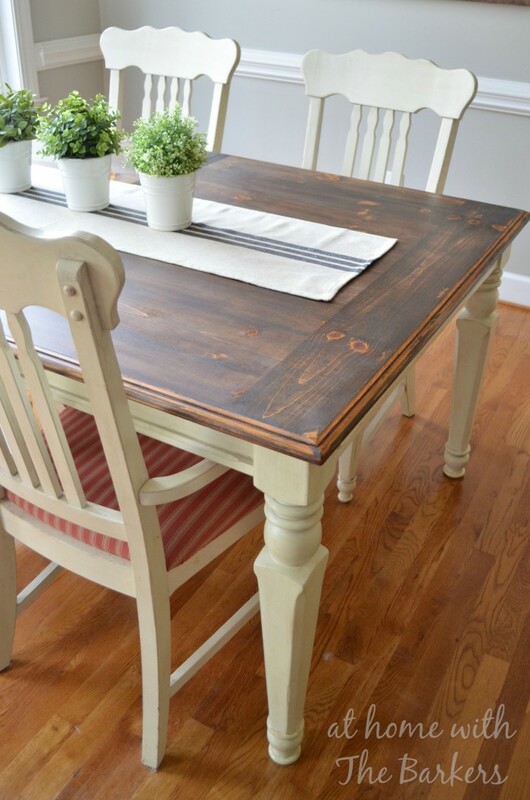 I love your farmhouse table, those gorgeous painted chairs, and how it is all put together in the room. Thank you so much…made my day! nice job dear! i love especially love those three pots, icing on the cake! 🙂 so adorable! It turned out gorgeous! Great job! Your table looks awesome!! I have never used wax but see many people use it now. Why would you use a wax vs. a varnish? Just curious since I have a couple of projects in mind. As with all paint projects they have a chance of getting scratched. It is hard to repair poly or varnish with out sanding and refinishing, with wax you can touch up the paint and wax right back over. Plus it has a great feel to it. You should try it. I was curious if you could tell me where you got your herb plants? Those are Faux plants that I purchased at Ikea! They look so real I want to get more! Can you tell me what kind/style of chair you have paired with the table? Thanks! Those chairs came with the table as a set. I purchased it at Rooms to Go almost 10 years ago. Where did you get your table runner? I’ve been looking for something exactly like it. Thanks, I purchased it at Hobby Lobby a couple of years back! How often does the wax need Re-applied? So did you use the soft wax instead of poly? I HATE POLY!!!!! Yes, soft wax, not poly. I avoid Poly unless it’s a must which is rare. Hello Sonya: I was wondering if you ever got info from “Wanda” regarding the “Restore” product? Is there such a product to not have to strip and sand? Starting a dining table project. Love your project. Want the exact look for my pieces. But I have a table, buffet and cabinet to paint and find an solution for each top. Lots of work ahead of me plus not much space to work in. Will actually have to do the work in the dining room area. Too hard to get each piece to a basement. Any advise/help is appreciated. Thanks! All content is © At Home with The Barkers LLC. Affiliate links and ads are used but clearly marked. Please do not use content without written permission.